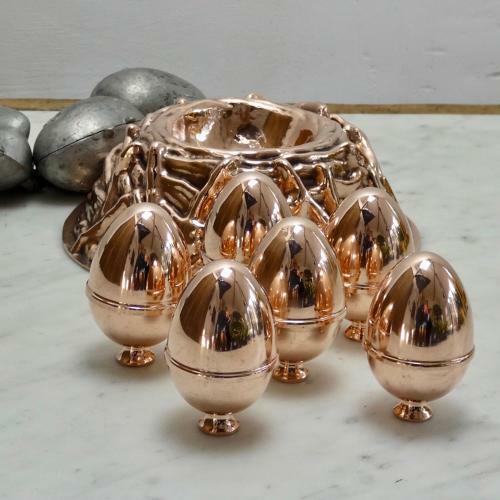 Six miniature, Victorian copper, two part moulds in the shape of eggs. These moulds were used for either jelly or ice cream. If using them for jelly you would fill them using the little funnel at the top. They would be filled to the rim and when the jelly sets it shrinks so you would end up with a perfect egg shape. They are all made from a substantial gauge of copper and they date from c.1880. They are all in excellent condition. The tinning, to the interiors, is slightly worn but they could still be used. They could make a fun addition to the Easter table.